I really wish I could be this excited about a Wings' prospect. Actually I wish we had offered up Kronwall in a package if the Canes were aching to give away the best defense prospect not in the NHL. If you want proof that the Hurricanes made the wrong move letting this guy go, just read on. The LA Kings fans over at letsgokings.com are having way too much fun Chuck Norris-izing Jack Johnson. They've dubbed him JMFJ, which obviously stands for Jack Mother F***ing Johnson. JMFJ once ate a whole cake before his friends could tell him there was a stripper in it. 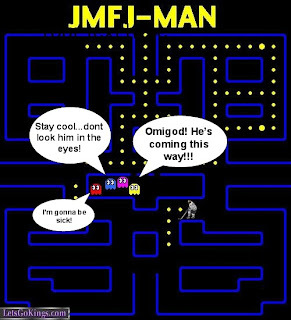 JMFJ died ten years ago, but the Reaper's too afraid to tell him. JMFJ's Rice Krispies are too scared to go Snap Crackle Pop, they just sit in the box going "Shhh, here he comes." JMFJ makes no wishes when he sees a shooting star. He calculates when he smacked the ****ing puck out of orbit. Hockey officials decided to rename it regular "Overtime" instead of "Sudden Death" because they already lost 244 hockey players when JMFJ took the wording literally. Why did the chicken cross the road? Because JMFJ told the chicken, "Get to the other side of the ****ing road!" I went on Millionaire and put JMFJ on my phone-a-friend list, and they just gave me the money.